The First Year Anniversary of Tacomic was a pretty unique event. Retro technology. Art. Cartoons. Unveiling. Tacoma civic issues. I have now had a chance to sift through the pictures I took at The Helm. It took some effort to get to though as the downtown was unbelievably jammed with cars for a Sunday. I had to park at Winfields. Here are some of the best pictures. Enjoy. Here, RR Anderson reveals the "Super Tacomic" an hour after the show started. Senior Editor of the Tacoma Daily Index Todd Matthews congratulates RR. The Index was featured in a sketch in RR's "Super Tacomic" as main supporting character. Yet, Todd kept his good sense of humor. A good downtown group showed up. Children had a chance to draw their own Tacomics which were then put up on the wall. She also picked up RR Anderson's "Pink Cookie Revolution" that she now uses as a cover for her menus. Some local synergy is definitely happening here. Interestingly, the picture of the food turned out to be one of the best for the night. Perhaps it was because of the lack of glare. The sketches show how hard getting on the Tacomics together is. It has to be apparently done in pieces and then pasted together with some computer enhancements. Here are RR's retro-tools. It's true that I am technologically inept in comparison to the numerous programmers at the event. Yet, I am probably one of the few people in the room who has actually programmed of these TRS-80 Radio Shack computers. My first one had 48k memory. The best picture of RR I took at the event through blind luck using my cell phone camera. As you can see, it was blurring light all over the pictures. Here, however, it works out perfectly with the stream of light coming in the window as if RR was receiving some sort of angelic blessing. If Jennifer from Tacomamamma comes to your event, chances are it will be a success. Here, Joe from Izenmania by blog and Sitecrafting by occupation buys "Blogger Uprising" which shows the state of Tacoma's blogosphere through the eyes of RR. I am sure I didn't see everything, but there did appear to a run on a number of Tacomics that were sold of during the event. Its nice to see the various Tacomics get a home. Please add or correct the information as needed by commenting. RR is letting is original art work be picked up pretty cheap. I don't know what percent are still left. The original unframed drawings were for sale for $10.00. That's right ten dollars for original Tacomics. Though its nice to move art fast to build more energy and interest. The Helm is a great place for local artists to get their work out in the public for a nominal fee. The location is great. The layout is perfect and the price is right. Just reserve a date, blog about it and perhaps pass out some flyers and you are set. Everyone is looking forward to the next Tacomic / Feed Tacoma event. Combining art, technology and civic interest and activism has been turning out to be a great combination. by OddTodd on 3/10/2008 @ 5:30am correction -- 'supertacomic' was purchased by someone else. by KevinFreitas on 3/10/2008 @ 6:32am Think he sold a couple more Tacomic's as well -- Izenmania grabbed one. The Kevin action figure Tacomic was actually at first secretly purchased but turns out ensie and Frinklin bought it for us as a gift. Thanks guys! by ensie on 3/10/2008 @ 9:29am The large panel piece Frinklin and I bought is "Ending the 19th Century" that features the "Cave Squid" and "Steam Lobster". It's now hanging proudly on our wall. Ron and Kate from the Volcano bought the Super Tacomic I believe. Ron and Kate also bought the "Scott Fontaine - Ace Reporter" I believe. by izenmania on 3/10/2008 @ 9:34am Not just a cave squid... a forest-dwelling cave squid. I feel like that scheme really only works for prints. I'm pretty sure that all of RR's pieces are equally rare. Me, I'm all for him pricing his stuff however he durn well pleases. by ensie on 3/10/2008 @ 11:11am Not just a cave squid... a forest-dwelling cave squid. You're right. My bad - forest dwelling cave squid. I do tend to get the various species confused. by morgan on 3/10/2008 @ 12:21pm Thanks RR- that was fun! But DANG! I missed the pink cookies AGAIN! by Erik on 3/10/2008 @ 12:24pm The Kevin action figure Tacomic was actually at first secretly purchased but turns out ensie and Frinklin bought it for us as a gift. What a relief. At least it ended up in your hands in the end. Cool. No doubt RR has many hidden messages in his SuperTacomic. One I have notice is that he used a controversial technique in both of these Tacomics causing the one incident of (temporary) censorship on Tacomic. I didn't realize that RR resurrected the (then) much discussed controversial technique in Super Tacomic until after the show. by NineInchNachos on 3/10/2008 @ 1:18pm The event was a joy. May your purchased art pieces bring you as much luck as they have brought me. I'm learning that community pays. literally pays. The great turtle flaps her wind upon us all. by izenmania on 3/10/2008 @ 1:34pm I'm learning that community pays. literally pays. It's true! You now have photographic evidence! I foresee an HFW testimonials page that's just the picture of us with a caption that says "Look! This guy is actually HANDING ME MONEY! What more recommendation do you need?" by Erik on 3/10/2008 @ 3:03pm I foresee an HFW testimonials page that's just the picture of us with a caption that says "Look! This guy is actually HANDING ME MONEY! What more recommendation do you need?" I am still wondering when "The Traveller" will pick up the half dozen pieces made about him. BTW, my Tacomic "Zimmerman's Legacy" is right beside my statute of "Lady Justice" in my office. R.R. Anderson's one-year celebration of his Tacomic cartoon on FeedTacoma.com â€” and for the past month, page 2 in the Weekly Volcano print version â€” at The Helm Gallery today was filled with Anderson's talent, tasty goodies from Herban Cafe and hello cupcake and the Tacoma blogging community. 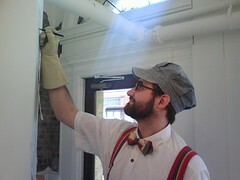 Anderson â€” donning a railroad conductor cap, Mork suspenders and off-white leather gloves â€” sported a perma-smile. It was a fun and fruitful way to spend an afternoon as I met new folks and walked away with two Anderson works of art. The have their own set of photos. The best one of the children taking turns at making Tacomics. It looks like 7 total pieces were sold. 5 regular Tacomics, 1 full panel and 1 Super Tacomic. Now it's my turn. I am going to have to see what it left now to add to my collection . Hmmmm. by izenmania on 3/11/2008 @ 8:49am Ooh, I've been juried! by Erik on 3/11/2008 @ 11:01am Ooh, I've been juried! Yes, and it looks like I got 6th place. All of the children beat me but one. I think I got a "participation" prize. Erik, this is your best photo. Infact this photo is one for the history books. by Erik on 3/11/2008 @ 11:37am The heavens did shine down on you in this one. The light appeared later as an apparition. Another explanation is that my cell phone camera malfunctioned just perfectly for the effect. Good thing I didn't use a better camera. by Erik on 3/13/2008 @ 10:18pm Don't miss the juried show of the children's Tacomics.